Falkirk&Callander Taekwondo club have established themselves as the Number 1 Taekwondo team in the UK by winning the recent team championships held in Coatbridge hosted by the Traditional Taekwondo Association chief instructor 8th Dan Grandmaster T.K.Loh. We sent 19 competitors to the event and came home with a total of 25 Medals, 13 Golds 6 Silvers and 6 Bronze, we have 13 UK champions now in our club. This is the 2nd Championship in a row that the club has won against opponents from England, Ireland Wales and Scotland, there was over 400 competitors on the day with categories for children and junior individuals and adult teams. The competition started at 9am with the children events where we won 13 medals Robbie player won 2 Bronze medals, Daniel Hesp won Bronze, Calum Hodge Ellie Fenwick and Jamie Thomson also won Bronze. Liam Muir had some tough fights winning 2 Gold and 1 Silver he fought Scott McCoull another of our students in one of the finals where Scott gained a Silver medal. We also had 2 of our girls winning Gold in their respective weight categories, Anna Holden who is the UK champion for the 2nd time and Eilihd Walker who in her first competition won a well deserved Gold. Ragnar Lochhead also won Gold in his first tournament with a clear 7 point victory. In the junior events we won 7 medals with 4 fighters competing in 7 different weight categories, we came out on top in this event with Alasdair Cox, Conan Irvine and Ross Walker winning a Gold and Silver each, Michael Taylor won Silver. A special mention has to go to Alasdair and Conan who fought each other twice in 2 finals and established themselves as the best Junior males in the UK, they had 2 hard matches the scores being 12-10 to Conan in the 1st bought and 12-9 to Alasdair in the 2nd, even though they come from the same club they had fierce matches very fast paced and most exciting junior matches of the day. It was a just result for them to share the glory, they are a credit to their club and family 2 great boys with fantastic attitudes and dedication to their chosen sport of Taekwondo. As said our 1st adult team for a few years was entered into the coloured belt category this was the last set of fighters for us on the day and turned out to be the most vital as we were up against the Harrogate club. Going into the ring Falkirk had 8 Golds Harrogate had 6 so whoever came out on top would be crowned the UK Champions. We won our first 2 bouts to go 2-0 up then lost the 3rd to make it 2-1 with 2 bouts left to win the Championship, we won this in the 4th bout giving us a 3-1 lead into the last fight with the final score being 3-2 to us it was a nail biting finish to a great day and for their efforts Tony Clark, Ricky Buchanan, Steven Peddie, Mark Doyle and Chris Whitelaw deservedly won the coloured belt team Championships and gained another 5 Golds for Falkirk. This is a fantastic start to the year for our students and another historic achievement for the club, all students and parents should be very proud of their achievements in this tournament, they and the club have a great future in Taekwondo so enjoy your moment and get ready for your next challenge. 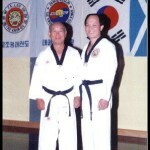 Grandmaster Park is one of four Grandmasters who devised the Taegeuk poomsae. When Korea, first became a republic, the first President Park Chung Hee ordered 6 of the top martial arts to send their best fighter to be his bodyguard. Grandmsater park was selected to represent Taekwondo.He was the presidential bodyguard for a long time and stayed at the Blue House (equivalent of the White House as blue is the royal colour of Korea). 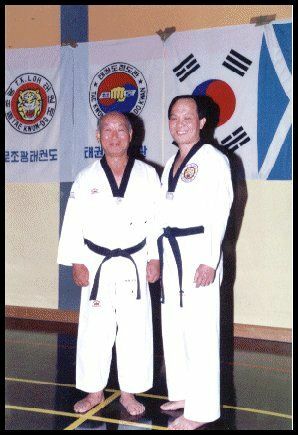 He is the Vice President of the World Chung Do Kwan Association. This is the oldest school of Taekwondo, which started in 1944 before the official naming of the art. The president is Uhm un Kyo who is also the President of the Kukkiwon, which is the Technical Centre of World Taekwondo Federation (WTF). Currently, although Grandmaster Park has retired, he now travels all over the world updating Taekwondo standards.